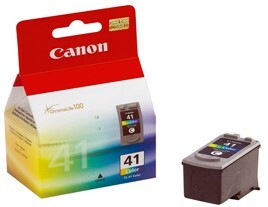 Genuine Canon CL-41 colour ink cartridge are the choice to make when you want the best possible results from your Canon inkjet printer. Carefully designed to work with Canon’s printers, using these cartridges will ensure that your prints are beautiful, your equipment remains in top condition, and ink wastage is minimised. Canon recommends using only its branded cartridges in order to avoid voiding your warranty. Canon CL-41 ink gives you prints which come out looking beautiful, with accurate colours, deep pigmentation, and a crisp, smudge-free finish every time. Tri-colour cartridges are also convenient; when using these cartridges, you’ll never find yourself short one colour in the middle of an important project.